Theresa Campau, mother of Louis Campau, is depicted as an elderly woman in her portrait. 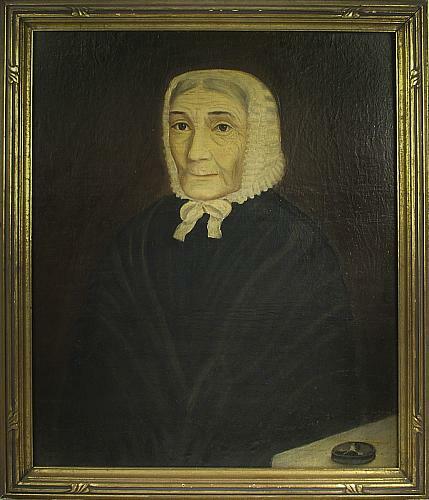 She wears a black shawl over a black dress, and a ruffled or pleated day cap that ties beneath her chin covers her grey hair, parted in the middle. A round, miniature portrait of a soldier is on the table in the lower right corner, possibly meant to represent her husband who died in 1858. A gilded, hand-carved wooden frame surrounds the portrait. Oil Painting, 23" X 27"
Title by Institution. Theresa Moran was born July 5, 1770 in Detroit, married Louis Campau in 1789 in Detroit, and died May 4, 1864, at age 94, in Grand Rapids. She is buried in St. Andrews Cemetery. Their son, Louis Campau, is considered the first permanent settler in Grand Rapids.